The holidays are over, leaving us with wonderful memories and widened waistlines. It’s not surprising that many of us are now in the hunt for low-calorie foods. If you’re one of them, try these meringue cups, they’re flourless, low-fat, refreshing and pretty. I often offer them to diners who want a light but satisfying dessert. Both the meringues and the accompanying sauce can be made ahead, so all you do at serving time is assemble them. Meringues require a completely fat-free environment to thicken properly. To get one, use a clean stainless steel or glass mixing bowl and avoid plastic utensils, (plastic is porous and can hold fat from previous uses even after a washing). Consider rubbing your equipment with mild vinegar (I use rice vinegar) to assure all fat residue is removed, rinsing it in water and drying it before starting the recipe. Use eggs that aren’t extremely fresh; they whip more easily than those straight out of the hen house. And, make sure there isn’t even a speck of yolk in your egg whites and that they’re at room temperature or even a little warmer before you start whipping them. Take your time as you bring them to stiff peaks. In the reduced air pressure found at high altitudes they can expand too quickly and then will collapse when the sugar is added or if too much of it is added at a time. Be sure to use superfine granulated sugar, as it dissolves very quickly, keeping the meringue light and airy. 1. Preheat the oven to 290 degrees with a rack in the center position. Line a baking sheet with parchment. 2. Make the meringues: In a small bowl, whisk the confectioners’ sugar and cocoa until well combined. Stir in the grated chocolate and set the bowl aside in a cool place (so the chocolate won’t melt). Using an electric mixer with whisk attachment (if you have one), at low speed (no higher) beat the egg whites in a clean, grease-free bowl until very frothy. Add the cream of tartar, slowly increase mixer speed to medium-high and beat until soft peaks form. Add the granulated sugar, a teaspoon at a time, beating well after each addition, until stiff peaks form. Add the extracts and beat again. 3. Gently (try not to deflate the egg whites) fold in the cocoa mixture with a large, grease-free spatula; stop as soon as all the dry ingredients have been absorbed. With a soup spoon, drop the meringue in 6 circular mounds, 3 ½ -inches in diameter, on the parchment paper, spacing them at least 2 inches apart. With the back of a smaller spoon, or your clean fingers, create an indentation (a cup) in the center of each. Bake for 10 minutes, reduce the oven temperature to 200 degrees, and bake for an hour. Check for doneness; they’re baked when they easily lift on the parchment. Continue baking if necessary. When they’re done, turn off the oven, partially open the door, and leave them in the oven until cool. Remove from the oven and gently lift each meringue cup off the parchment. Store them, covered, at cool room temperature, for up to 4 days. 4. 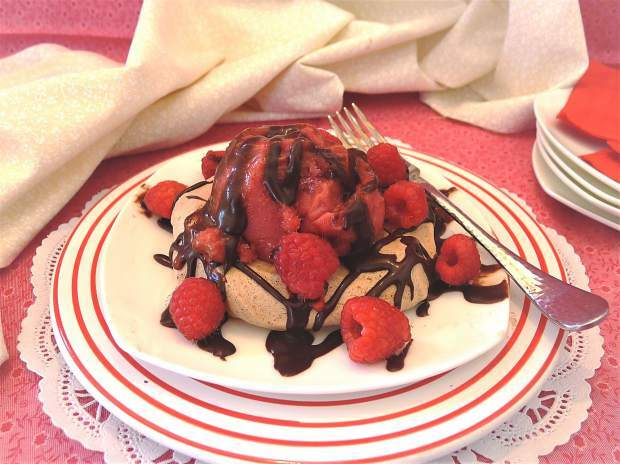 Make the chocolate-raspberry sauce: Whisk the sugar, cocoa powder, and cornstarch in a small saucepan until combined. Add the water, 1 tablespoon at a time, whisking after each addition until blended. Whisk in the jam. Bring to a simmer over low heat, whisking constantly, until the mixture thickens. Remove from the heat, whisk in the Crème de Cassis or raspberry liqueur, if using. Cool and store, covered in the refrigerator up to 4 days. Serve at room temperature or slightly warm. When ready to serve, top each meringue with a scoop of sorbet, a drizzle of sauce, and a sprinkling of fresh raspberries.